Perhaps no vocalist of our time possesses a more exquisitely versatile instrument than the Grammy® -nominated (Best Classical Recording 2010) American baritone Jubilant Sykes. 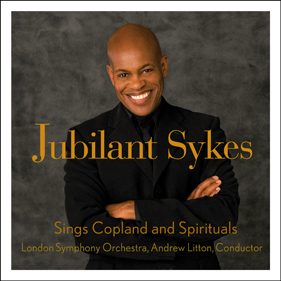 Jubilant Sykes Sings Copland and Spirituals shines with hallmark brilliance, a revelation of rich vocal timbre and expressive interpretation. The results are stunning. Sykes’ first recording with the London Symphony Orchestra, made at Abbey Road Studios, will endure as one of his finest–and, perhaps more than any other, help to define this great singer’s artistry. On a cool, clear March morning, as baritone Jubilant Sykes and members of the London Symphony Orchestra gathered in London’s legendary Abbey Road Studio One for this recording, there was an air of excitement and anticipation, the unmistakable feeling that something significant was about to take place. After recording the intensely powerful spiritual, Were You There?, the studio fell completely silent, suppressing the emotion that the performance had instilled in all those present. After the requisite silence, spontaneous shouts of “bravo,” applause, and the sound of rapping on music stands crescendoed from the appreciative orchestra. It confirmed what all who hear this recording surely must realize — that when Mr. Sykes was named “Jubilant,” the title was apt.